This is the third in a multi-part series on using events as an avenue for marketing your brand, product, or industry. For part one in the series, start here. Event Marketer, it’s time to put on a new hat: Marketer of Events. You won’t be blamed if you say those sound indistinguishable. Allow us to explain. An an event marketer, you’re in charge of building a brand through events. But as a marketer of events, you have a more acute task: fill chairs. Specifically, fill chairs with the right people at the right price. Got it? Now, for some more actionable guidance. Selling your event is much like selling anything else. It requires targeting leads, making a pitch, and closing the sale. So how would you sell anything else? Relaying how your event meets a felt need in the life of the potential attendee is the first task before you. What’s the difference between a career that excludes your event, and one that was marked by attendance? Highlight the education an attendee will receive, and the networking opportunities they’ll experience. The good news for a marketer of professional events: you’ve been tasked with selling something that actually has inherent and tangible value. Conventions and conferences are a $23 billion industry. Obviously, their significance is felt in the marketplace. But there’s one group of people who will never attend your event, no matter how fabulous your speaker lineup or social hours are: those who never hear about it. Time to get the word out. Your event needs a face. Or in marketing terms, an identity. Before you start any kind of marketing, you need to establish the look & feel of your event. Primarily, a logo. Investing in a professionally designed logo will have impact throughout your event. But establishing your brand doesn’t end with a mark. Everything from fonts to colors and naming conventions will affect your professional appearance. Consider the TED conference. 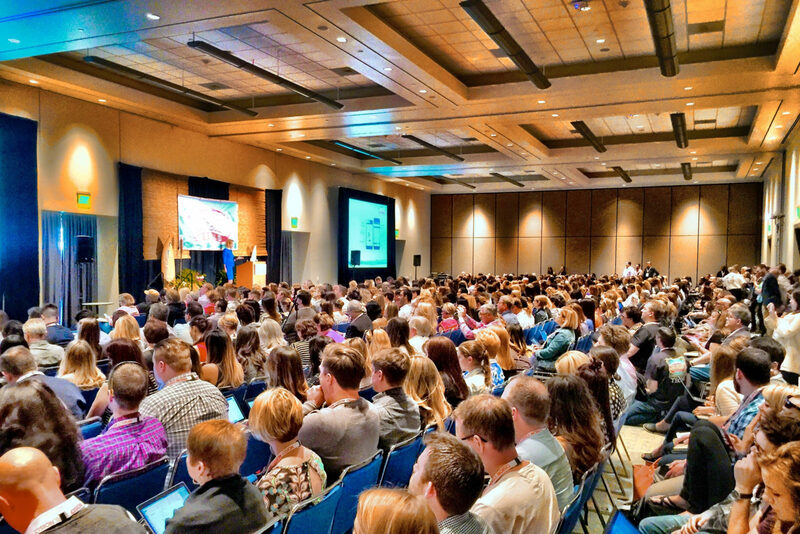 Originally named for technology, entertainment and design, the conference has become the preeminent speaking gig for any thought leader, on most any topic. And yet, the series hasn’t lost its sense of cohesiveness. So how do Jill Bolte Taylor and Monica Lewinsky share the same stage with any degree of continuity? Branding. The TED brand is as ironclad as they come, from the all-caps logo, down to the iconic round red carpet. If TED is an intimidating standard, not to worry. As they say, shoot for the moon and you just might land among the stars. Seventy years ago, designing a newspaper ad and eye-catching poster would have been followed by a satisfied drink and a feeling of accomplishment. Today, there are endless channels for advertising. The sheer quantity of media outlets today makes the significance of each one smaller; the importance of spreading your message wide, irrefutable. Social media. Email marketing. Local news. Podcasts. Digital campaigns. Radio interviews. Cold calls. Which do you choose? All of the above. If all drains lead to the ocean, all other forms of advertising will lead to one place, too: your event landing page. If your event is an offshoot of an existing brand, don’t reinvent the wheel. Create a subdomain within your primary web address and park your message there. Your landing page should have one objective, and likely not what you’re expecting. Collect email addresses of potential attendees. Of course, your site should also provide plenty of information about sessions, networking events, scheduling, accommodations, and pricing. But contact information from a lead is like gold in the hand of a marketer of events. If your site only gives visitors the option of buying tickets or leaving, you’ll miss out on the opportunity to educate those on the fence about the merits of attendance. One way to hook visitors into providing their email addresses is to offer insider access or tips in exchange, like revealing the name of a secret speaker or early access to educational sessions. There are several ways you can build a formidable email list. First, using your personal network. Second, the email addresses you’ve amassed from your landing page. Third, existing lists from partners, such as a university’s department list or student body list. And fourth, purchased lists from relevant brands like industry magazines or professional organizations. Discounted early sign-ups. Offer several tiers of pricing with steep discounts for those willing to act immediately, such as a 48-hour sale and a 30-day discounted rate. These first signups are invaluable to you, as they’re your first case studies to discuss with potential sponsors and partners. With a few early bird signups, you can provide actual company names and industries to interested parties. Teaser Video. If your keynote speaker is willing, have them record a short teaser video that touches on their topics and encourages viewers to attend your event. If they’re a high profile figure or simply decline this invitation, ask for permission to send out a highlight video of a previous speaking appearance. Special access. Offer early attendees or email subscribers special access to an exclusive networking reception, meal, or upgraded accommodations. Alternatively, offer a raffle among all early signups for free accommodations or other prizes. If you don’t yet have enough of a quorum on social media to have any impact, consider influencer marketing. By tapping into the existing channels of “influencers,” you can spread your message among thousands of followers without doing the heavy lifting of building up a following yourself. The trade-off? Money. You’ll likely need to pay these social media mavens for access to their followers. One potential exception is if your keynote speaker also has a social media following. You may be able to negotiate a certain number of social media mentions into your contract. Alternatively, offer influencers a set of free tickets in exchange for their promotion. Online ads have come a long way from the 1990’s. The days of the smells-like-a-scam pop-up window are long gone. In their places are algorithm-driven windows of highly relevant content. Google, Facebook, and YouTube have changed the game in the digital advertising space by building extremely fine-tuned characteristics of individuals. Everything from favorite music to past occupations can now be used for targeting. Use this capability to target an audience not already in your network. If your network is filled with millennials, target professionals from 35 to 50 years old. The goal here is to avoid spending unnecessary funds on reaching an audience that you can approach for free. TV and radio advertising require big budgets. Even modest runs require that you record a commercial. Writing, recording, and editing ad spots is out of the question for 90% of professional events. An exception to this is large stadium-sized events, or those with broad appeal to specific regions. But that doesn’t mean you can’t get your message on TV or radio. You may be able to secure interviews with local news stations, talk shows, or radio programs without charge, in exchange for discussing topical news of the day or offering your professional insights on a relevant subject matter. If that header alone doesn’t give you heartburn, you’re one brave little toaster. Cold calling is the most dreaded activity of most salespeople, but that doesn’t mean it’s ineffective. Following a clearly mapped-out plan will give you both an advantage in terms of effectiveness and reduced anxiety in the process. If you have sales team, work with them to contact any customers and partners you think might want to attend. Do this after your first campaign email, so they have some level of awareness about the event. Follow up two additional times with reminders of your event’s speaker and event lineup. Create special discounts to be used on an as-needed basis to convert customers into attendees. Launch a contest for free tickets among your existing customers/partners. If excess tickets still exist, offer them without charge as a way to encourage sales of your product or service. As speakers confirm their slots, sponsors and partners announce their plans, and attendees fill your roster, update your website and social media platforms with the news. Your soft leads will only increase in interest as developments occur. A broken record is unlikely to persuade, but a new development in a long line of impressive speakers and sponsors? Now that could seal the deal.